Imagine this for a moment: an elegant dish that is not only vegetarian, it's vegan. Plus, this recipe is low-carb and uses less than five ingredients. It's true! French-inspired "White Beans with Tomatoes and Sage" is a rustic yet refined pressure cooker recipe that can be effortlessly prepared in your MultiPot. 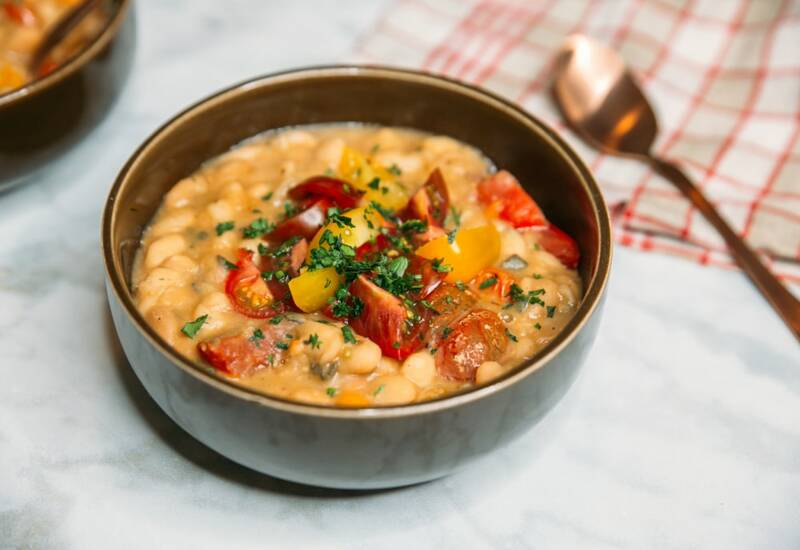 Hearty Great Northern white beans are accompanied by fresh cherry tomatoes and sage for an irresistible combination to warm your belly on a cool evening. This dish can be a meal in and of itself, or served alongside your favorite roasted beef or chicken dish. Place beans in inner pot of pressure cooker and pour cold water over beans to cover by 1 inch. Lock pressure cooker lid in place and set steam vent handle to Sealing. Select Pressure Cook (manual) and cook on High Pressure for 1 minute. Turn steam vent handle to Venting to quick-release pressure. Drain and rinse beans under cold water, discarding cooking liquid. Transfer beans back to inner pot. Stir vegetable stock and onion into beans. Lock pressure cooker lid in place and set steam vent handle to Sealing. Select Pressure Cook (manual) and cook on High Pressure for 15 minutes. Let pressure release naturally. Stir tomatoes and sage into beans; season with salt and pepper. Fresh sage is a classic fall and winter herb that pairs well with squash, pumpkins, roast poultry, and stews. Did you know it is possible to freeze fresh sage? To savor the incredible flavor year-round, you can always freeze the leaves. To do so, wash and pat them dry, remove the leaves from the stems, and pack them loosely in freezer bags for up to one year. Per Serving: 87 calories; 0g fat; 16.1g carbohydrates; 6g protein; 0mg cholesterol; 742mg sodium. This might be the most-ridiculous recipe ever. You won't believe the amount of flavor and texture you get from this, I swear! The sage and tomatoes are perfect foils for the creamy white beans. It's rare I don't reach for the hot sauce, but this one is so perfectly seasoned, it would have been a sin to adjust it with heat. White beans with tomatoes and sage are an excellent go-to fill-me-up meal. Maybe next time I'll add some bacon and garlic, but this is a solid recipe, and so great I don't need to soak the beans overnight. I enjoyed this dish and all of the really good flavors it embodied. You don't have to waste time soaking the beans overnight, and the pressure cooker does all the hard work. I love how simple this was, very good. I think white beans are so underrated! This recipe was fantastic. It's super simple but is packed with a ton of flavor. The onion, tomato, and sage make for a winning combination. Such a great recipe and perfect for a side dish or to serve with lunch. Yes, it’s that good. I made this with a rotisserie chicken and some veggies. There is an error in the recipe. Fifteen minutes is not long enough to cook the beans, even after a presoak. The same recipe is in the booklet that comes with the Multipot, and instructs to cook for 55 minutes. Thought they needed more flavor, so I added carrots, celery, garlic and nutritional yeast. And chopped kale.